This month, Bootie LA – LA's original mashup bootleg party – celebrates ELEVEN years of mashing it up it up in Los Angeles!! There will be special performances throughout the night, as well as plenty of birthday surprises, plus FREE Bootie 11-Year Anniversary CDs to the first 300 people! Only $5 before 10 PM! 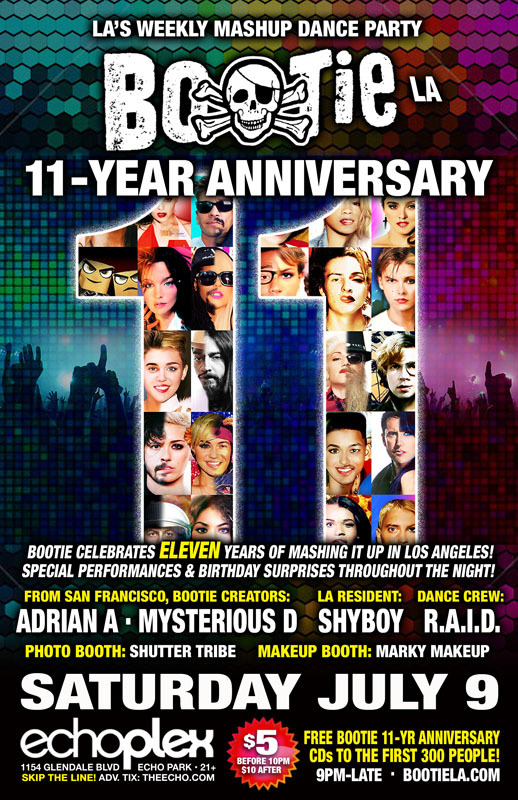 Bootie celebrates ELEVEN years of mashing it up in Los Angeles! Free Bootie 11-Year Anniversary CDs to the first 300 people! Special performances and birthday surprises throughout the night! Bootie LA marks its 11-Year Anniversary, with resident DJs – and creators of Bootie – Adrian A and Mysterious D coming down from San Francisco to join resident DJ ShyBoy on the decks, as the three spin the very best mashups from the past eleven years! There will also be special performances throughout the night, as well as plenty of birthday surprises, including a Midnight Mashup Show from Bootie LA’s infamous resident dance crew, R.A.I.D. (Random Acts of Irreverent Dance), who will also be providing the go-go eye candy all night! Marky Makeup will doing airbrush tattoos, while Shutter Tribe will be in the house to capture all the insanity. And to top it all off, there will be exclusive 20-track Bootie LA Anniversary CDs for the first 300 people through the door, featuring the all-time best Bootie mashups from the past eleven years!